” Row, boatman, row to land !” — When lo ! Gigantic grew the boatman’s size ! His eyes fell joy and spite express’d. and clasp’d The abbot to his burning breast. And gently murmuring flows the Clyde. Still sings, — ” In Blantyre shines the flame? Blantyre Project Comments: This part open with the Blantyre Priory monk throwing Jane overbaord so the boat is lighter. He asks the boatman to row back to land in the storm. But, with the boat already almost full of water, they weren’t going to make it to land, unless the boat was lighter. This time it was the monk’s turn to be afraid. The boatman, realizing the only way to save the boat was to throw the monk overboard, moved in on him. BUT, it’s too late, down goes the boat taking all 3 sorry victims to the bottom of the tempest Clyde waters between Bothwell Castle and Blantyre Priory. 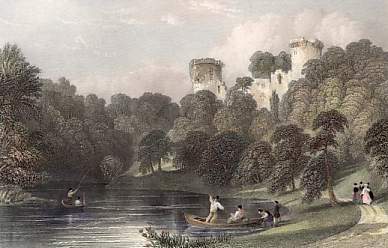 Legend has it upon every Halloween, in the dead of night the ferryman can be seen, and from the ruins (wreck) of the old Blantyre Priory the signal lamp can still be seen at midnight, with the phantom Jane seen from Bothwell Tower! She plays her lute to her lover Edgar. So that’s our full story! One that doesn’t bode well with a manipulative and violent monk and a tale where an innocent Bothwell lass meets her maker. Of course this is all just made up, a ballad no less, but it has to have some foundation. This is a wonderful story to scare the living daylights out of anybody each Halloween and written over 200 years ago, certainly deserves to be heard. Hope you enjoyed.